Hi there! Great that you have reached this page! 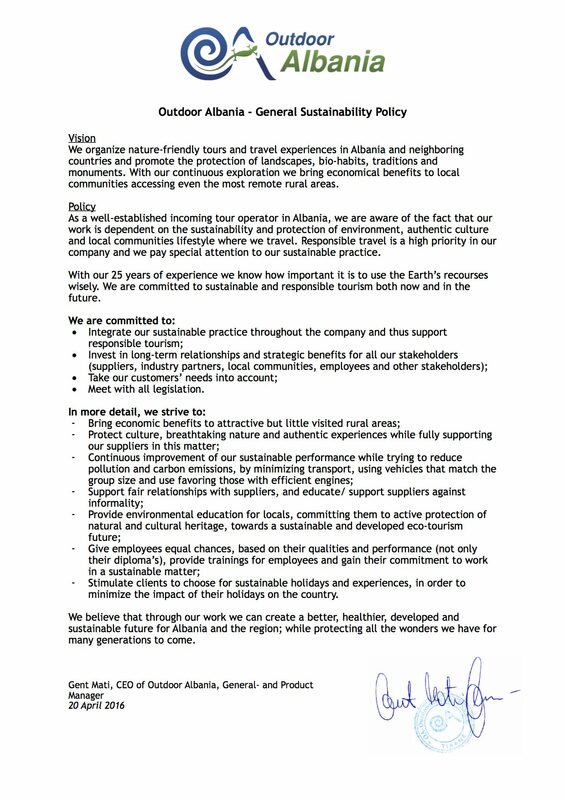 Sustainability is a high priority for us and together with you we would like to contribute to the protection of the environment, authentic culture and the local communities’ lifestyle of Albania. In this way we can, together with you, make sure that people can enjoy Albania’s beauty for many more years to come. At Outdoor Albania we love what we do, and we want to sustain it. With our 25 years of experience we know how important it is to use the Earth’s resources wisely. However, unfortunately, we also have to be realistic, as a small company we cannot have the same impact as public institutions have but we like to believe that we can make a difference by taking small steps and inspiring others to join us. Please have a look and see what we do to create a better, healthier, more developed and sustainable future for Albania and the surrounding countries. During the communist time there was little to almost no plastic used in Albania. After the fall of the regime Albania went through a period of rapid development, with this development came the usage of new materials such as plastic. Receiving a plastic bag with your groceries is still seen as an extra service but people are often not aware of the fact that plastic does not dissolve. Therefor waste management is still a big problem in Albania. We strive to improve this by raising awareness and by educating all our local stakeholders about waste management. Of course we hope that one day all plastic bags will be banned from shops but for now our reusable lunchboxes are a simple solution. With these lunchboxes we stop the use of wrapping the picnic lunches and at the same time our guests have the opportunity to buy a nice souvenir. We sell these lunchboxes against cost price, making it very easy for guests to contribute to a cleaner Albania. We like to provide our guests the best possible experience by showing them the pure and authentic Albania but we cannot do this without our local partners. It is therefore only fair to provide them the best possible experience as well. With our continuous exploration we bring economic benefits to local communities, reaching even the most remote rural areas. We invest in long-term relationships and strategic benefits for all our partners. Moreover we strongly believe in giving our employees equal chances based on their qualities and performance, instead of only looking at their diplomas. We provide trainings for our employees giving them the chance to develop themselves and to gain their commitment to work in a sustainable matter. When you travel with us in a small group we make us of public transport as much as possible. This will not only minimalize the carbon emission but it also provides you a nice experience being among locals. If it is not possible to travel by public transport we make sure that we use vehicles that match the group size and we favor vehicles with efficient engines. We think that responsibly and sustainability does not have to stop at our doorstep. Therefore we also support different kinds of local projects. Our influence varies from raising awareness to donating supplies to attending fundraising events or anything else we can do to contribute. For examples and more information on the local projects we currently support, please click here. Support animal welfare and we do not promote or sell any kind of cruel animal entertainment or tourist experiences that cause or perpetuate animal suffering. Generally speaking, if you can hug it, ride it, swim with it, or have a selfie with it on holiday, those animals have suffered for tourist entertainment.